The Senate on Wednesday passed a $34.3 billion energy spending bill that backs up President Barack Obama's promise to close a nuclear waste facility in the southwestern state of Nevada. The bill, passed by a 85-9 vote, also covers hundreds of water projects being undertaken by the Army Corps of Engineers. 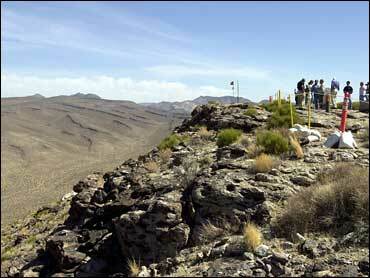 The Yucca Mountain project 90 miles (145 kilometres) from Las Vegas was designed to hold 77,000 tons of waste, but has been strongly opposed by the Nevada delegation, which had been outgunned in its efforts to kill it. The move fulfills a campaign promise by Obama to close Yucca Mountain, which was 25 years and $13.5 billion in the making. It would, however, leave the country without a long-term solution for storing highly radioactive waste from nuclear power plants. The waste disposal problem has become worse since the federal government scrapped plans to open Yucca Mountain. Instead, radioactive fuel rods are now stored in large concrete and steel canisters on the grounds of nuclear plants around the country. The 1987 law requiring waste to be stored at Yucca Mountain remains on the books, however, so the project could in theory be revived. The Yucca Mountain project would still receive the $196.8 million budgeted by Obama for work on the site - and to keep several hundred employees working - though the money won't go to ship waste there. The House of Representatives earlier this month passed its own $33.3 billion measure covering energy programs and water projects that also contained the Yucca Mountain provision. The two bills now go to a House-Senate conference committee to work out differences before a final bill can be sent to the president. The Senate also adopted an amendment by California Democratic Sens. Dianne Feinstein and Barbara Boxer to allow for water transfers to help farmers in California's Central Valley suffering from severe drought conditions. The underlying bipartisan measure has money for a wide variety of programs, including clean energy research, and has more than 600 so-called earmarks for lawmakers, mostly for Army Corps of Engineers projects.